LinkExchange SearchMe WhatWeDo AboutUs Sitemap Next page Costs per kilogram of a mechanised harvest. Costs per kilogram of a mechanised harvest. The 4 golden rules of harvesting onions or potatoes. An assessment of a mechanised harvest, bearing in mind the rules of a successful harvest. Harvesting at the right time. Removing the onions or potatoes from the field as quickly as possible. Avoiding physical damage to the onions or potatoes. Harvesting at the lowest cost. We will now look at how a mechanised harvest follows the four golden rules of a successful harvest. First rule: Harvesting at the right time. The quicker you can start harvesting, the easier it will be to harvest at the right time. The simple fact that a mechanised harvest requires less people means that it can be started as soon as the weather allows. Having two or three people available to control the machinery is much easier than organising dozens of people and having them available (waiting around, basically) until the weather and the crop conditions are right for harvest. Second rule: Remove the onions from the field as soon as possible. Manual harvests can never compete with mechanised ones in this aspect. 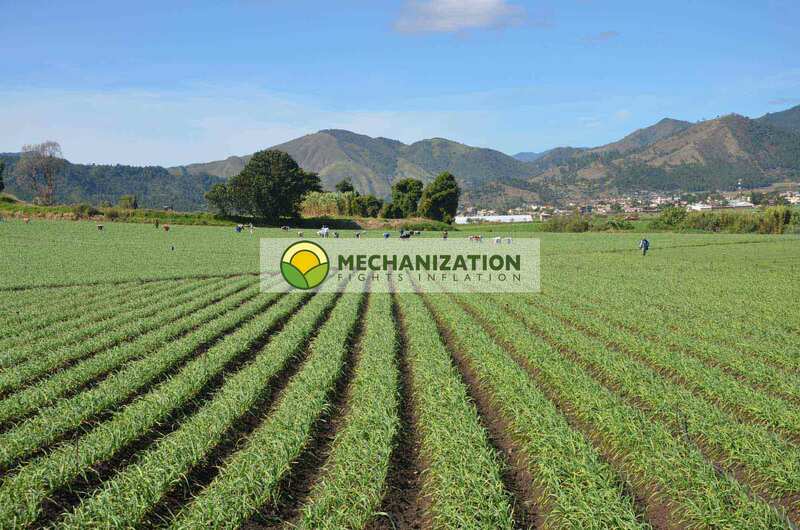 The mechanised harvest moves an average of 0.75 hectares per hour of onions or potatoes from the field, regardless of production per hectare. Capacities of mechanised harvests with relation to production per hectare. per hectare. Production in Kg. Onions may look hard, but they can be damaged easily. Damaged onions often do not show visible harm, but signs of bad treatment start to appear within a week or two, in transit or when exposed to adverse storage conditions. This drawing demonstrates the importance of not overfilling jute bags: to avoid pressuring and damaging the produce within. 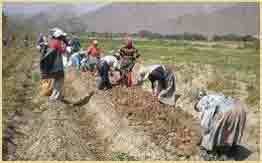 Manual harvest is the slowest way of harvesting. Do not underestimate the negative effects of pulling deeply-rooted onions from the ground, topping irregularly (mechanised toppers cut the plant in a much more controlled way than a machete), loading the onions in jute bags, and the rough handling of these 60 to 100 pounds of onions during transport. During a mechanised harvest, the onion plants are topped whilst they are still in the ground (and the length of the remaining stem is kept very consistent), and the bulb suffers next to no damage at all. 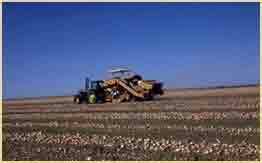 Nowadays, the harvesters and machines that pull the onion from the field are so well adapted and padded that the onions practically sustain no physical damage whatsoever. For more information on the potential damages during a mechanised harvest, visit: Avoiding damage during a mechanised harvest. Fourth rule: Harvest at the lowest cost. The most indicative figure of the cost of a harvest is the cost per kilogram of produce. We won't go into calculating the cost per kilogram of a manual harvest, for the simple reason that this figure would vary from country to country and from grower to grower. Only a grower who is very honest with themselves would be able to calculate the true cost per kilogram of produce in a manual harvest. Why do we say a grower who is very honest with themselves? This is because generally speaking, growers who harvest manually tend to underestimate the true costs of a manual harvest and exaggerate the potential costs of a mechanised harvest. This is why we have dedicated an entire page to showing how to calculate the cost per kilogram of produce during a mechanised harvest. We will also calculate the costs per kilogram of harvesting different sized fields (5, 10, 20, 50 and 100 hectares) to further demonstrate the effect of economies of scale. Next up: Costs per kilogram of a mechanised harvest. 1. To be able to start harvesting as soon as possible once the grower has seen that the produce is ready to be harvested. 2. The entire harvesting process must be carried out in the shortest timeframe possible. 3. Throughout the process, you must be aware of the physical damage which the produce can undergo. 4. Last but not least: harvest at lowest cost possible. The most important figure in the cost of a harvest is the cost per kilogram of produce.